Passenger service: July 1918 - August 1958. Existing abandoned portions: part of 2 platforms on abandoned trackways. Touring: The nearest stop is 161 St on the 4 B D trains. To see what remains, go up Ogden Ave from Jerome Ave, turn into 161 St, and walk onto the footbridge over Sedgwick Ave and the Major Deegan Expressway. The outdoor portion of the platforms is visible in the bushes, and the location of the portal, hidden under the highway, is marked by an old stone wall on the land side of Sedgwick Ave. Numerous routes are called "elevated subways"; this is part of an "underground el". As part of the Dual System planned in 1913, the Interborough Rapid Transit (IRT) company built an extension of the joint 6 Ave and 9 Ave els from 155 St and 8 Ave Manhattan, to join the City's Jerome Ave route. 155 St had long been a joint terminal of the Manhattan Railway's elevated lines and the predecessors of the New York Central's Putnam Division. The extension routed the el over the railroad's Putnam Bridge, and the railroad was cut back to a new terminal on the Bronx side called Sedgwick Ave, where there had not been a station before. From here the el was pointed directly at a spur of rock. The IRT blasted a tunnel for three blocks to the other side, and then continued the line by elevated to meet the City's Jerome Ave line at 162 St, which is over River Ave at that point. The el extension was opened in July 1918. At first el trains provided the main service to the Jerome Ave line, but subway trains (called the 4 train years later) became the main service by the mid 1920's. Joint operation of subway and el trains lasted till 1940, when the City took over the IRT routes and eliminated several els including the 9 Ave El. The closing of the 9 Ave El was not however the end of service through the tunnel. A remnant of the 9 Ave El continued to run, a shuttle from 155 St to 167 St. Sedgwick Ave was the only transit connection to the New York Central's Putnam Division terminal, and 155 St was busy when there were baseball and football games at the Polo Grounds at 155 St. The shuttle hung on until 1958, when the Putnam Division closed and the baseball Giants had already moved out west. When the shuttle was closed, the steel elevated structure was removed, along with Putnam Bridge, but the ground level portions and tunnel remained. Sedgwick Ave station was mostly at ground level with concrete platforms on each side of the two tracks. The west end was a wood platform on a steel structure passing over the New York Central's Hudson Division. The east end was in tunnel for about a car length. Thus it was just barely an underground station. The remaining part today are the platforms at ground level and into the tunnel. See also the page for the Jerome Ave station at the other end of this short tunnel. 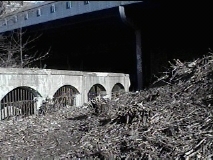 The remains run from the stone retaining wall next to the Metro North Hudson Line on the west, through the tunnel to the wall on the west side of Jerome Ave.
Also shown, in Manhattan, closed old stairways from the 155 St viaduct down to street level on Douglass Boulevard had a connection to the 155 St el station at one time. Above, Sedgwick Ave station is shown looking north on a sunny day circa 1918, with the brick Putnam Division station just behind. The street entrance from Sedgwick Ave itself is almost visible at extreme right, at the top of the stairs. 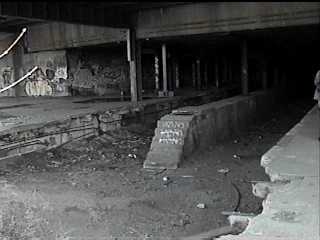 At right, Mark Feinman's 1999 photo shows the remains cut down to platform height, with the Major Deegan Expressway now running over part of the station. Old photo: Source unknown, Robert L Presbrey collection, from Alan Paul Kahn and Jack May, The Tracks of New York, Number 3, Manhattan and Bronx Elevated Railroads, 1920, New York: Electric Railroaders' Association, 1977. New photo copyright 1999 by Mark Feinman. From http://www.nycsubway.org/irt/9thave/ at the New York Subway Resources site. Some Putnam Division EMUs can be seen here with the el station extreme right and the railroad stationhouse behind it. In the foreground is the steelwork for the former railroad route off Putnam Bridge. The tall building in the background is the Wilson company, publishers of the Readers' Guide to Periodicals. Above, a train of Composite cars stops at Sedgwick Ave circa 1940 on its way downtown. This is just to the right of the previous image, and the base of the Wilson company building is visible. The wooden platform in the foreground is on the steel viaduct over the New York Central Hudson Division, leading to Putnam Bridge behind the photographer. To the right of the train, note the steps up to the concrete wall between the tracks. Right, in a 1999 photo by Mark Feinman, note the same concrete wall, and the portion of the station in tunnel behind it. The foreground is overshadowed by the Major Deegan Expressway. Old photo of Putnam Division station: Source unknown, J K Winslow collection, from Daniel R Gallo and Frederick A Kramer, The Putnam Division, New York: Quadrant Press, 1981. Old photo of el train in station: George E Votava, from Alan Paul Kahn and Jack May, The Tracks of New York, Number 3, Manhattan and Bronx Elevated Railroads, 1920, New York: Electric Railroaders' Association, 1977. New photo copyright 1999 by Mark Feinman. From http://www.nycsubway.org/irt/9thave/ at the New York Subway Resources site. The Transit Authority saved the station sign that was once posted at the entrance on Sedgwick Ave, and it is seen here on display in 2002. The Sedgwick Ave platforms are visible in this aerial photograph taken in 1995. They are just north of the footbridge over the Major Deegan Expressway, at the end of 161 St.
After entering the tunnel, the line curves to run under 162 St, the next street up. The other portal is under the pale grey building at the end of this part of 162 St. From there the viaduct ran along the north side of the next part of 162 St (just below the very white area), and then curved north to join the elevated structure in River Ave which can be seen widening at far right for the long-abandoned junction. The Putnam railroad station was under the expressway. The large Wilson Company building on Sedgwick Ave is seen in the old photos above. The tunnel did not follow a street, and its exact location eluded mapmakers. From the end of Putnam Bridge north of 161 St, it took a slightly northeast course, coming out to run on an el along the north side of 162 St. In a 1920's Rand McNally map, it is shown too far south. This map shows Putnam Bridge as a railroad bridge, but also shows SEDGWICK STA. (sic). The map accompanying the 1939 Geographia Street Guide to Manhattan and the Bronx shows Putnam Bridge correctly, but does not show Sedgwick Ave station as a terminal for the Putnam Division. Jerome Ave station is shown where the Anderson Ave entrance was located, up the hill at 162 St, but the elevated portion to the east is shown curving wildly off its real course. The Hagstrom map gets the most things right. The tunnel actually curves more gradually into 162 St than shown. This 1945 map shows the el ending at 155 St, which still has the double express station circle that had been irrelevant since 1940. The Board of Transportation's 1948 Hagstrom subway map shows the el shuttle from 155 St. With no indication of the Putnam Division terminal, it looks pretty superfluous, with the new free transfer at 161 St available. A photo tour of the tunnel, including both stations, can be found on the New York Subway Resources site, http://www.nycsubway.org. More photos from the same tour are at the Forgotten NY web site.